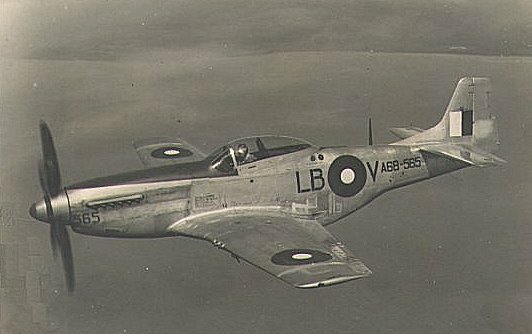 P-51K-10-NT Mustang A68-565 (#44-12512) of 84 Squadron RAAF piloted by Squadron Leader James Albert Cox (290787) made a spectacular forced landing during take-off at Ross River Airfield near Townsville at 1945 hours on 7 August 1945 after an apparent engine failure. The Mustang ended up 1 mile east of the Bohle River Airfield. Squadron Leader Cox was slightly injured. 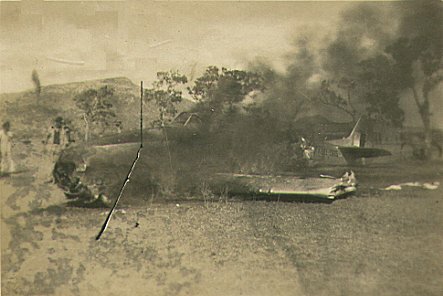 The Mustang caught fire after the forced landing. 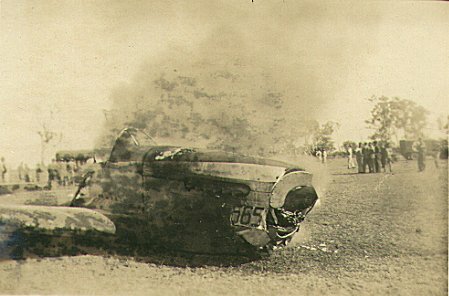 Cox was able to open the bungs on his fuel tanks after he exited the wreckage to minimise the chance of an explosion. 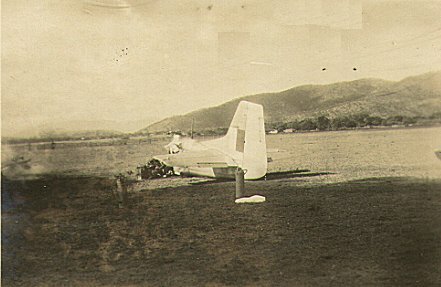 The crash site was near the road to Charters Towers at the end of the Ross River airfield between the Townsville racecourse and the Meatworks. The Mustang was issued to No. 6 CRD RAAF for conversion to components. "Lost a complete bank on T/O. A/C lost all power and wiped 6 Ft. off each wing tip going through trees. A/C completely burnt. Got six stitches in cheek and a beaut "Shiner" for the Duke." My father, William (Bill) Hardidge (Decd) was an LAC Armourer attached to 84 Sqn at this time. 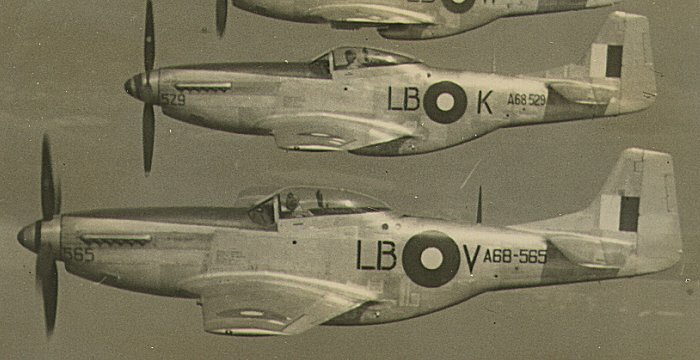 He related to me that he was riding a pushbike at the end of the strip at the time Sqn Leader COX's P51 was taking off on a maritime patrol carrying 2 x depth charges. 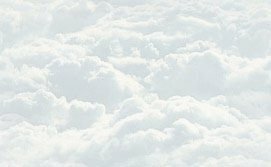 He said that as it passed overhead he heard the engine began to cough and splutter badly and the aircraft lost power and height rapidly. 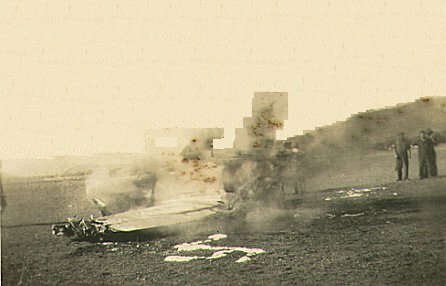 The aircraft crashed as you and the depicted photos show. 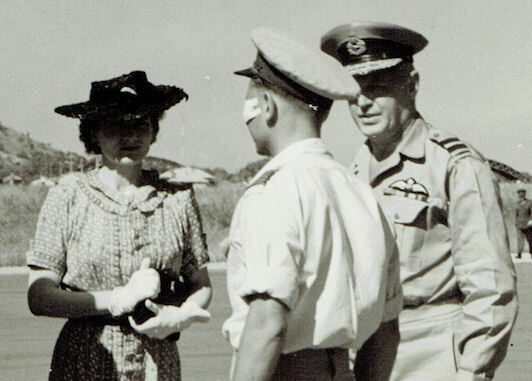 My father hurried to the scene and the first thing he told me he sighted was a pair of depth charges partly buried in the ground. He said these had been jettisoned from the aircraft before it crashed. He next came across sections of the main wings near the base of the two trees shown in the photographs. The aircraft fuselage had passed between and sheared these wing sections off. 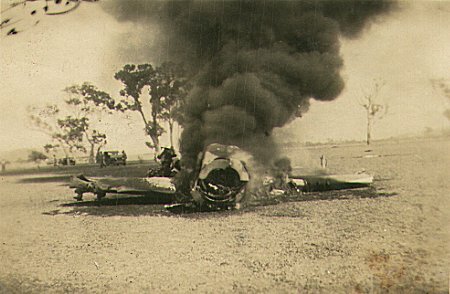 He then rode past the tail section towards the remains of the engine and cockpit which had already begun to burn. 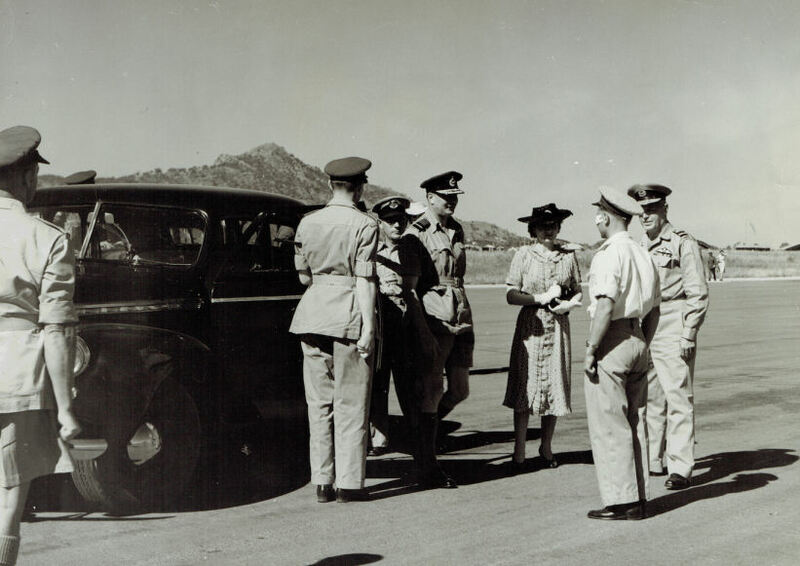 He told me that he wasn't looking forward to seeing what remained of Sqn Leader COX but could not see him in or next to the aircraft. As he approached he heard a voice casually state "....G'day Mate, wouldn't have a smoke on you?". COX was standing against a nearby tree with a bump on the head and what would be a great black eye! My fathers relief was short lived, however, as being an armourer, he was given the task of going back to "make safe" the two jettisoned depth charges. 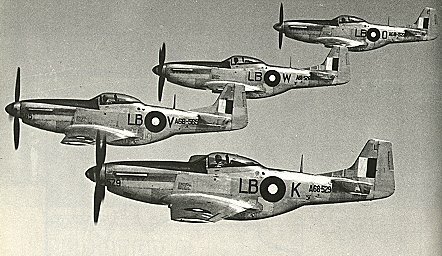 My father was attached to 84 Sqn from late 1944 until discharged after the war. I believe there are still some photographs of some of his "moments" if I look carefully. Many thanks for a wonderful site and the information that it provides. 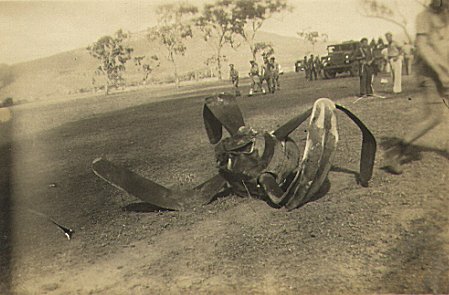 Note:- The DVD "Diary of World War II North Queensland" shows this accident happening on 2 August 1945 at Bohle River Airfield rather than at Ross River Airfield on 7 August 1945. The photos above appear to be taken at Ross River Airfield. 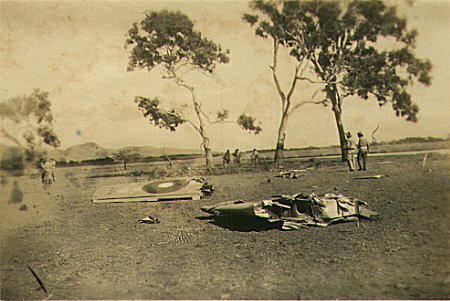 The "Preliminary Report (Internal) of Flying Accident of Forced Landing" in National Archives of Australia shows the aircraft as A68-656, but the "656" is crossed out and someone has written in pencil "565". The Preliminary Report states that the accident took part "1 mile East of Strip". Stewart Wilson's books also shows this crash as happening at the Bohle River rather than at Ross River airfield. As stated above, the photos appear to be in the Ross River airfield area. 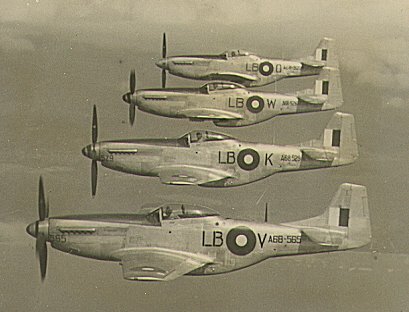 84 Squadron RAAF was based at Ross River Airfield at the time of this forced landing. I'd like to thank Mark W. Hardidge for his assistance with this web page.